This show is about a football team run by Satan; that is the concept. A high school football team that just happens to feature the Prince of Darkness as quarterback. We expect that you'll be running off†to find out how and why Satan is wearing cleats, and continue with the review as a mere formality. Seriously, the usual disclaimer about sports anime- that you'll enjoy it more if you're interested in the sport to begin with- doesn't really apply in this case. The show, sponsored by NFL Japan, is filled with colorful, lovable characters, features† great gags with pitch-perfect comic timing, and taps into a lot of what makes team sports appealing overall. Even those of us who could care less about football in general (and excuse us!) found ourselves charmed. 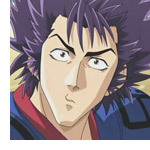 To start with, the show has one of our favorite shonen protagonists, Sena Kobayakawa. In the wake of Naruto's gigantic success, there's been a crop of super-confident young boys helming the genre lately, but Sena is the exception; he's shy, physically small, and has spent much of his life either running away from bullies, or doing errands for them to keep them off his back. Anyone who's ever felt bullied in any way will find themselves rooting for Sena from episode 1. 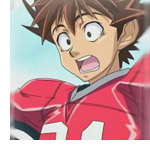 However, Sena has been so busy running from bullies that he's become one hell of an evasive runner, something not lost on the school's resident devil, Hiruma, who has an inexplicable passion for America football. 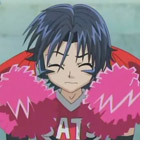 Recruiting for his nascent team, the Deimon Devil Bats, he taps Sena as his star running back against his will. 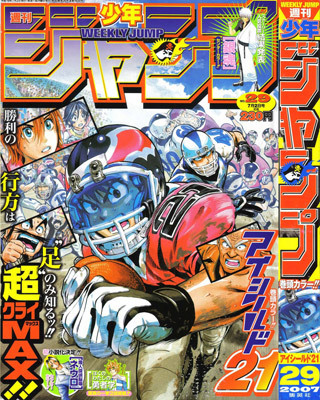 With Hiruma's backing, Sena takes up the mantle of the mysterious Eyeshield 21 during games, keeping his identity a secret to†prevent rival sports teams from poaching him. 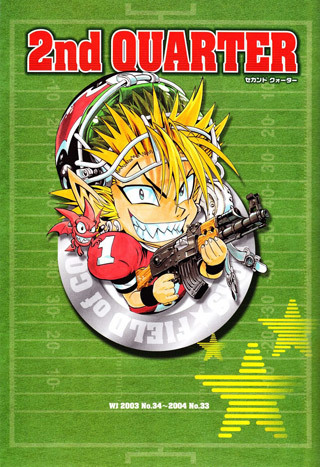 Hiruma isn't literally the devil- err, probably- but watching his gleefully sadistic approach to football is a hoot. 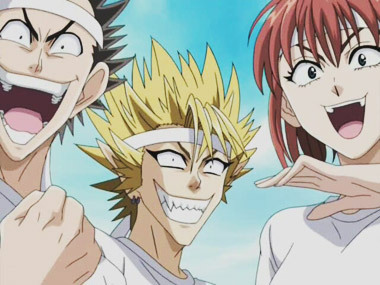 Willing to win at any cost and thinking that sportsmanship is for losers, Hiruma engages in all manner of diabolical scheming, psychological warfare and flat-out criminality to snag victory for the Devil Bats. However, while it may not seem like it at the beginning, Hiruma does have certain lines he won't cross, keeping the second lead from becoming an outright villain. 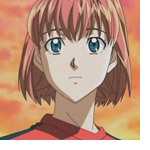 The main cast is rounded out by Kurita, a tremendous lineman who wouldn't hurt a fly off the field (who may remind viewers of Hagrid from the Harry Potter series, another gentle giant) and Mamori, Sena's childhood friend who becomes the team's manager to protect him, unaware that he's the star running back. The series also mines the zoomorphism and underlying myths that form the thematic core of team sports with the team dynamics; the Chameleons actually change tactics to match their opponents, the Poseidon create a powerful defensive wave, and the White Knights are properly noble and defensive. Because of this feature, the conflicts take on a nigh-mythic significance; in addition to just being tests of skill, the match-ups between the teams are usually presented as philosophical clashes. The series also gets a ton of mileage out of mining the visual potential of each team's trademark formations and mascots, both comedically and dramatically. 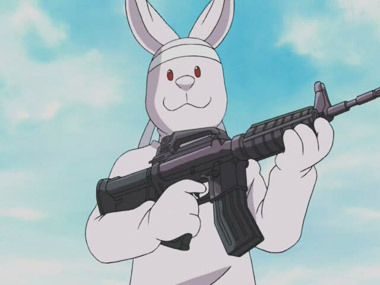 Artistically, the series is a bit of a mixed bag. 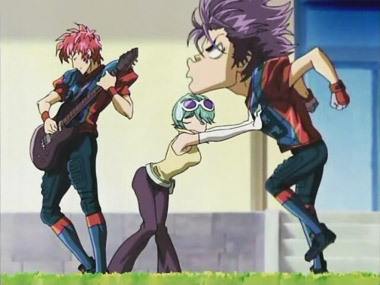 The animation goes for humor above anything else, meaning that sometimes the characters look downright ugly. We didn't mind it, but the style is not for everybody. Musically, the series is well†above average, with catchy OP and ED themes- despite some occasionally mangled English lyrics- and memorable background music. 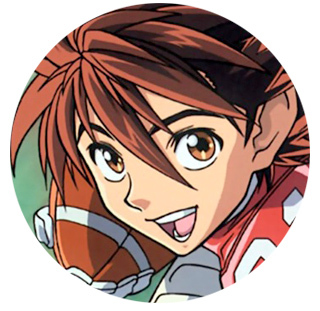 As a comedy first and foremost, Eyeshield 21 doesn't need any kind of transcendent message, however, there is some depth there for those willing to look for it. 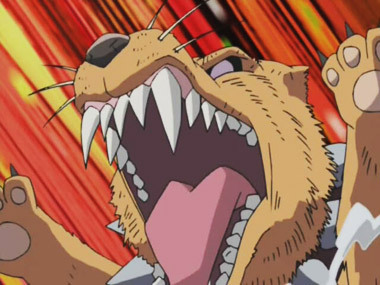 Is Hiruma's determination to win against all odds, which the rest of the Devil Bats absorb, crazy and unrealistic? Or is it about accepting the nature of commitment, to not expect anything less than the best from yourself once you've set your mind to something? You be the judge. 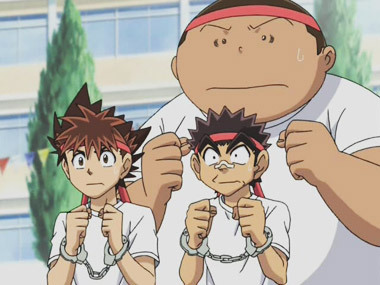 Those who seek out the Shonen Jump manga will find some differences from the show; as is often the case, the anime includes some filler episodes that might be too silly for some viewers (although some of them are very funny.) Hiruma is a slightly different character in the manga- more of a genius mastermind than a literal demon- whereas the anime honestly makes more sense if you assume that Hiruma is either a)the actual†devil, b)endowed with†demonic powers or c)at least calling in some favors from downstairs. 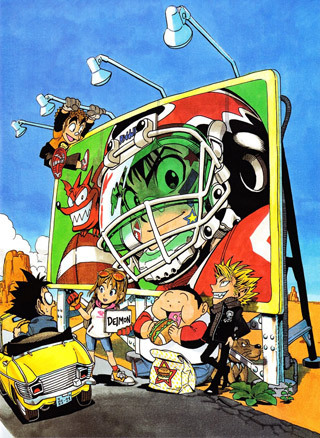 Of course, if you accept the idea that Hiruma is the devil, you might have to wonder why the devil would care so much about winning a high school football tournament, but that would be thinking about this show entirely too hard. 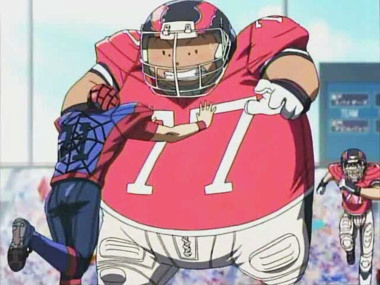 Participation in American football in Japan has gone up since the show aired, meaning the series has done its job in helping to popularize the sport. 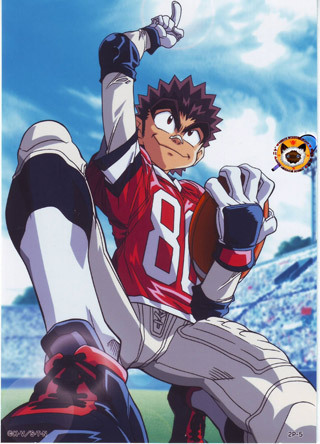 We can only hope that all the kids who were inspired by the show to put on cleats and protective padding have picked up on Hiruma's passion for football, and not any of his tacticsÖ. 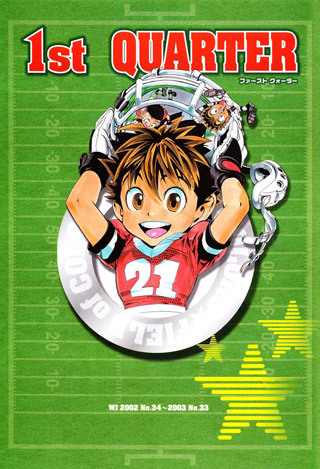 currently, Eyeshield 21 is available streaming on Crunchyroll, and on subtitled DVD from Section 23 films. 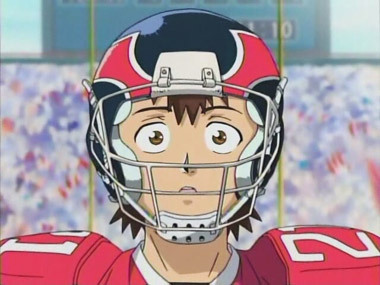 Below: Scenes from Eyeshield 21. 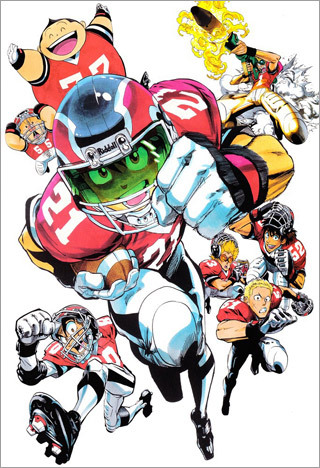 Below: Promotional illustrations for Eyeshield 21.